Has crumbling foundations bailout become a political football? Eleven Republican representatives accused House Democratic leadership Friday of using more than 34,000 homes with crumbling foundations as political leverage to secure GOP votes for the next state budget. In a letter signed by 11 Republicans, the group objected to a Democratic argument that any state resources to address this problem should be appropriated only through the main budget bill adopted annually, or the related budget policy implementation bills. Republicans are expected to vote against those measures if they close a major deficit in the next two-year budget with tax increases, deep municipal aid cuts and with a union concessions framework that extends a controversial benefits program for five years. But many Republicans are expected to join Democrats in backing a proposal to spend $11.9 million next fiscal year to assist eastern Connecticut homeowners with failing foundations. What do GOP lawmakers do, though, if the homeowner assistance funding they like is rolled into a budget they don’t? Although a final bill still is being negotiated, components under consideration would provide grants to replace or repair crumbling foundations and establish a low-interest loan program in collaboration with the Connecticut Housing Finance Authority. 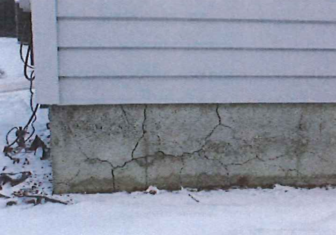 Towns where deteriorating foundations have been reported to the state Department of Consumer Protection. The foundations are crumbling, at least in part, because of quantities of the mineral pyrrhotite present in the concrete aggregate, according to a January report from the Department of Consumer Protection. Many homeowners’ claims have been denied by insurance companies on grounds that the problem did not meet their policies’ definition of a structural collapse — leaving residents to face the huge cost of foundation replacement or repair. Traditionally, appropriations are only approved through the budget bill and implementation measures — but there have been exceptions, including one with a cost very similar to the foundation assistance bill. In the spring of 2008, the Democrat-controlled House and Senate did not want to make adjustments to the second-year of a two-year budget plan, despite analysts’ warnings that weak tax receipts put the plan at risk of deficit. Still, the legislature passed a standalone bill ordering one new General Fund appropriation – just under $10 million for various criminal justice initiatives. But Aresimowicz also said it is just one example of the many types of assistance Republican lawmakers press him for regularly to support their respective districts.